A fisherman has been arrested for allegedly stabbing a sea lion with a steak knife after the animal stole his bait. Hai Nguyen, 24, was arrested Friday and being held at Newport Beach Jail on $20,000 bail. He was expected to be arraigned next week on a charge of felony cruelty to animals, authorities said. 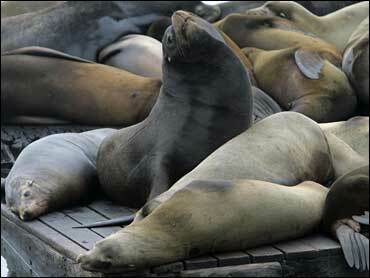 The sea lion, a six-foot female weighing about 150 pounds, was severely wounded and was later euthanized. "It's a horrible thing," said Dean Gomersall, animal care supervisor at the Pacific Marine Mammal Center in Laguna Beach, where the animal was euthanized hours after the attack. "My crew is extremely upset, and we're just glad the person was caught." Authorities said the case also was being investigated by the U.S. attorney's office for possible federal charges under the Marine Mammal Protection Act. Police said Nguyen was fishing off a Newport pier about 12:30 p.m. when the sea lion apparently snatched the bait from his fishing pole. Becoming upset, authorities said Nguyen stabbed the animal with a steak knife. "It was close enough so he could just reach out and stab it in the water," said Sgt. Evan Sailor, a police spokesman. "A number of people witnessed it and called police." Nguyen was arrested without incident at the pier, Sailor said. The animal was recovered by volunteers from the marine mammal center. They discovered that a knife wound had pierced its heart. Nguyen could face a $25,000 fine and up to a year in prison if convicted on the animal cruelty charge. A conviction on federal charges of violating the Marine Mammal Protection Act could add $12,000 in civil penalties, criminal fines of up to $20,000 and additional jail time, authorities said.